"He who does Christ's work must stay with Christ always." Known posthumously as the "Angelic Painter," Fra Angelico helped usher in a revolution in Italian painting. Steeped in a new humanism, Angelico and young painters such as Masaccio insisted on painting religious subjects in a rational, illusionistic space and with all of the solidity of the human body. A friar in the mendicant Dominican order, Angelico fused piety and artistic innovation to create some of the most deeply moving frescoes and altarpieces of the Early Renaissance period. His transformation of late medieval painting influenced later Renaissance painters, and his religious devotion and feeling for humanity inspired artists centuries later who were searching for ways out of stale academicism. His time in the monastery meant that Fra Angelico was immersed in an intellectual milieu that married Christian theology with classical texts. This new humanism insisted on the importance of rational thought and ushered in ideas of individual autonomy that shaped the Renaissance. Following artists such as Leon Battista Alberti and Masaccio, Fra Angelico translated this emphasis on rationality and precision into painting by creating illusionistic settings using linear perspective to organize his compositions. Fra Angelico's artistic career coincided with the changing landscape of patronage in 15th-century Europe. Being a Dominican friar in addition to being a painter meant that many of his early works were commissioned by the increasingly powerful Dominican order, but as his reputation grew, he also received many commissions from the new wealthy class of merchants and bankers in central Italy, cementing his reputation as one of the most important painters of the time. Baptised Guido di Pietro, little is known of the friar-painter Fra Angelico's childhood. Giorgio Vasari, writer of Lives of the Artists (1550), proposed 1387 as Angelico's date of birth, but many art historians, citing his stylistic correlation with contemporary Italian painter Masaccio, think it more likely that he was born around 1395. While his birth date remains unknown, we do know he was born in the Mugello valley near the town of Vicchio, situated near Florence, and that he was one of three children. 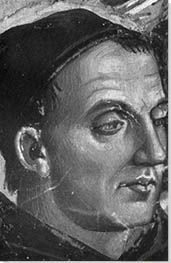 Angelico's brother, Fra Benedett, also became a friar, his sister's name was Checca. The identity of his parents remains unknown, but it is widely assumed that Angelico was born into a prosperous family to have received the training as an artist that established the foundations for his artistic career. Distinctive in its shape, The Last Judgement fulfilled a unique purpose as a seat backing for the priests and attendants during high mass in the church of Santa Maria degli Angeli in Florence. Depicting the narrative in which Christ decides whether the deceased should go to heaven or hell, it is a visually complex composition that shows Fra Angelico adapting traditional Last Judgment prototypes with new innovations. Christ sits elevated in the heavenly skies encircled by a mandorla and a host of angels; to his left and right are the Virgin Mary and St. John the Baptist who are flanked by rows of Saints. Below the heavenly scene, is a long row of opened tombs, signifying the dead to be judged. To the left of the tombs, one sees abundant vegetation, and angels blissfully dancing around the gateway to heaven and gazing towards the skies. Conversely, on the right the damned are forcibly dragged by devils to the depths of hell to incur various punishments. It is possible that Fra Angelico took over this commission after his teacher Lorenzo Monaco died. The raised halo around Christ's head is a detail more common to older depictions, and the scenes of hellish punishment are copied from another Last Judgment fresco found in Pisa, suggesting that perhaps Fra Angelico did not design the entirety of the composition. What was uniquely his, though, was his innovative use of illusionistic perspective to create a captivating narrative. Likely influenced by the works of Lorenzo Ghiberti that also employed linear perspective, Fra Angelico depicts the tombs receding towards the horizon, creating depth on the flat surface of the panel, and he arranged the Saints in a concave semicircle above, giving the impression that they are seated at different distances to the viewer. Also unprecedented is the depiction of dancing angels before the gates of heaven. Art historian Chreigton Gilbert suggests that this detail might come from part of a 15th-century hymn based on newly discovered patristic texts that describe how "a wheel is formed in heaven of all the saints in the garden...they all dance for love...they are dressed in particolors, white and red"
The wealthy Florentine banker Palla Strozzi commissioned Lorenzo Monaco to create an altar for his family's funerary chapel, and it was installed in 1432. Scholars agree that the pinnacles above the Gothic arches of The Deposition of Christ were completed by Monaco and that the central panel is undoubtedly the hand of Fra Angelico, but there is considerable debate as to whether the altarpiece was left unfinished at Monaco's death or if Angelico was commissioned later to rework the central panel painted by his teacher. In either instance, Angelico created an innovative scene of serenity and drama within the confines of an old-fashioned Gothic frame. Positioned centrally, Christ's body is lowered from the cross that fills the space below the middle arch, and as is traditional in these scenes, Christ is surrounded by mourners, including Mary Magdalene, who kisses Christ's feet, and the Virgin Mary, who kneels in prayer. To the right of Christ stand John the Evangelist, Nicodemus, and Joseph of Arimathea, but there is also a contingent of men dressed in contemporary Florentine dress, one of whom holds nails and a crown of thorns, relics of Christ's crucifixion. In the foreground, opposite of Mary Magdalene, a friar (perhaps a portrait of Alessio delgi Strozzi, Pallo's recently deceased son) kneels before the scene and gestures towards the viewer, inviting the viewer to mourn Christ's sacrifice. Despite the restrictive Gothic-style frame, Angelico paints a panoramic view that recedes far into the distance. To the left, we see the towers and buildings of Jerusalem, and to the right the rolling hills and trees of the Tuscan landscape. The juxtaposition of the historical and the contemporary were designed to draw the viewer in and elicit prayerful devotion. Additionally, Fra Angelico's meticulous attention to detail - the blood running down the cross, the grain of the wood, Christ's greenish pallor, and the foliage on the trees - allow the viewer to feel closer to the events unfolding. His use of bright reds and blues enliven the composition, but the respectful, undramatic reactions of the mourners underscore the gravity of the scene. Originally placed across from Gentile da Fabriano's International Gothic Adoration of the Magi, Angelico's Deposition of Christ pointed a new way forward for Italian Renaissance painting. Executed for the cloth merchant Giovanni di Cola di Cecco for the church of San Domenico in Cortona, The Annunciation conveys the moment in which the archangel Gabriel announced to Mary that she would become the mother to the Son of God. Set in a simple columned loggia with a minimal landscape to the left, Fra Angelico creates a dramatic scene. While the words of Gabriel's announcement (translated as "The Holy Spirt shall come upon thee, and the power of the Highest shall overshadow thee") and Mary's response ("Behold the handmaid of the Lord. Be it unto me according to thy word") are written on the surface of the painting, Fra Angelico followed his contemporary Massacio's lead in creating weighty, solid figures situated in a rationally designed space. The two figures bow inward toward each other, each responding to the other, as they embark on a journey that will be the salvation of humankind. To underscore this theological connection, in the far distance, Angelico depicted the expulsion from Eden of Adam and Eve, whose sin made Christ's salvation necessary. The loggia and garden are symbolic of Mary's chastity and seclusion, and the predella below represents various events in Mary's life. While the component parts of the scene are minimal, Angelico's training as a manuscript illuminator is evident in this work. The intricate details of Gabriel's robe and the delicate flowers in the grass belie the simplicity of the work. Angelico excelled at presenting different textures; the marble floor of the loggia appears smooth against the ruffles of Gabriel's robe, and the feathered texture of his wings contrast greatly against the polished finish of their haloes. The Cortona Annunciation's masterful display of fine details and illusionistic space set the stage for Angelico's more mature work in the decades that follow. A subject depicted many times by Fra Angelico, the Coronation of the Virgin illustrates the crowning of the Virgin Mary as the Queen of Heaven. Possibly commissioned by a group of nuns for the church of Sant'Egidio, the painting depicts an event that takes place on heavenly clouds, where Christ crowns Mary with a diadem. Surrounding the scene are groups of figures, many of whom gaze towards the skies, basking in the heavenly rays; at the front of the crowd, angels swing incense, and in the upper portion of the golden sky, angels plays instruments. In the bottom left corner stands bishop Sant'Egidio dressed in blue, and beside him an archbishop, presumed to be Zenobius, gestures outwards toward the viewer; Saint Dominic, dressed in white with a black robe and holding lillies, directs his glance towards the viewer. To the right are Mary Magdalene and Saints Margaret, Agnes, Lucy, and Cecilia. Perhaps a request from the nuns who commissioned the painting, the gold background recalls earlier medieval altarpieces that employed gold leaf to suggest a divine space. Fra Angelico's use of it here hindered his usual deep, panoramic backgrounds, but he was still able to create the illusion of some space. Rays of light, incised in the gold leaf emanate from the center point between Mary and Christ, draw out a curve, creating the sought after depth. Additionally, the cloud on which the two sit curves in a concentric shape, also creating the illusion of distance. While still containing a plethora of details, from wisps of clouds to spectacularly illuminated robe hems, there is more of a classicizing symmetry present here than in earlier works. Commissioned by Cosimo de' Medici for the San Marco convent, this work is also known as the San Marco Altarpiece and is exemplary of Angelico's innovative techniques. The Virgin and Child sit enthroned in the center of the composition. The Christ child makes a blessing gesture with his right hand and holds an orb in his left, signalling his dominion over the world. A patterned curtain behind the throne bisects the composition, and an intricately patterned carpet lays in the foreground. The Virgin and Child are surrounded by a symmetrical retinue of angels and saints; Saints Dominic, Francis, and Peter Martyr stand to the right of them, and to the left are Saints Mark, John the Evangelist, and Lawrence. Saints Cosmas and Damian, patron saints of the Medici Family, kneel before the throne. Widely regarded as one of the first forms of a sacra conversazione (holy conversation), Angelico's compositional approach was revolutionary for the time. Instead of portraying each of the saints separately in multiple flanking panels, he created a unified space on one panel for all of the figures. Additionally, his precise construction of space, following Alberti's theories, ensure the centrality of the Virgin and Child amidst the numerous figures. The intricate foreshortened rug draws the eye towards the throne, a small set of steps elevates the Virgin and Child, preventing them from becoming lost amongst the Saints, and the naturalistic background creates depth, rendering the enthroned the central focus of the composition. Most representative of Angelico's experimental approach is his inclusion of St. Cosmas; gesturing towards the Virgin and Child and gazing outwards, he calls upon the viewer to direct their attention to the central pair, resulting in an engaging viewing experience that can only be described as revolutionary. The San Marco Altarpiece would become the model for other Florentine altarpieces into the early 1500s. 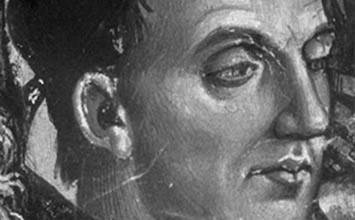 Fra Angelico and his assistants created over fifty works for the convent at San Marco. The majority were frescoes, and this Annunciation painted in the north corridor is perhaps one of his most famous. Here, Angelico simplified the scene even further than his previous versions; there is no background scene of Adam and Eve expelled from Paradise, the setting is more austere, and the figures more modestly dressed. We can focus completely on Gabriel and Mary at the moment the angel announces that she will miraculously give birth to the Son of God. The loggia remains the setting, but the garden is now fenced. We can see into a sparse room behind Mary that has a small window. These new details further symbolize her chastity and seclusion. Despite the simplicity of the composition, the fresco exhibits a surprising level of realism. The drapes and folds in Gabriel's and Mary's garments elicit a sense of fluidity, and the plants and trees flourish beyond the columns. Importantly, its placement in the corridor at the top of a staircase would have added to its realism. The indistinct light source in the painting would have appeared to be coming from a nearby window in the stairwell, thus integrating this vision in the monks' physical space as they climbed the stairs to their dormitories. Appearing oversized for the space, Gabriel and Mary are positioned diagonally to one another, creating depth and further drawing the viewer into their interaction. While The Annunciation does not possess the same ornate details as many of Angelico's previous works, it is no less striking in its emotive value.